The Refresh for active reports setting enables active controls to automatically modify current views of bound active reports when you select a new value. Each bound active report is modified not only by the new selection in the active control with the Refresh for active reports setting, but is based on the current state of all active controls in the active dashboard. This action is triggered at run time when you select a new value in an active control with Refresh for active reports set. Enabled (or checked) empowers the active control, only after you make a new selection, to modify bound active reports. Disabled (or unchecked) prevents any bound active report from being modified when you select a new value in the active control. 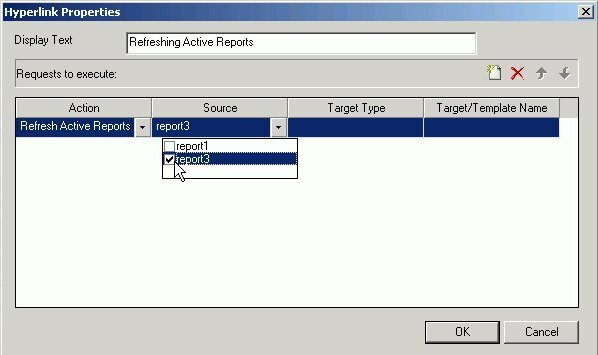 In order to update active reports when a value in the active control changes, you must check the Refresh for active reports check box on the active reports Properties and settings dialog box. Refresh for active reports is selected by default. You may want to disable the Refresh option if there are multiple active controls that require each control to be set before you refresh your output. If you are using multiple controls, you can associate the refresh option with a Push Button or Hyperlink, enabling you to refresh the output once all the controls are selected. From the Parameters tab, select active report as the Control Value. The active report options appear. Select the Refresh for active reports check box. When an active report is first selected, Refresh for active reports is enabled by default. From the Insert menu, select Controls, then click Push Button. From the Insert menu, select Components, then click Hyperlink. Drag the crosshair to add the Push Button or Hyperlink object to the layout and adjust it to the size you want. If inserting a Push Button, right-click the push button object and select Create hyperlink from the context menu. The Hyperlink Properties dialog box opens. If inserting a Hyperlink, the Hyperlink Properties dialog box opens. Optionally, you may change the name of the Push Button or Hyperlink in the Display Text field. From the Hyperlink Properties dialog box, select the New icon to add a request to execute. Select Refresh active reports from the Action drop-down list. Select the Source drop-down list to select which active reports should be refreshed. The Source drop-down only lists the embedded or referenced active reports in the layout. Click OK to close the Hyperlink Properties dialog box.